They are perfect as a special occasion kind of treat – think Valentine’s Day, Christmas or a birthday gift. 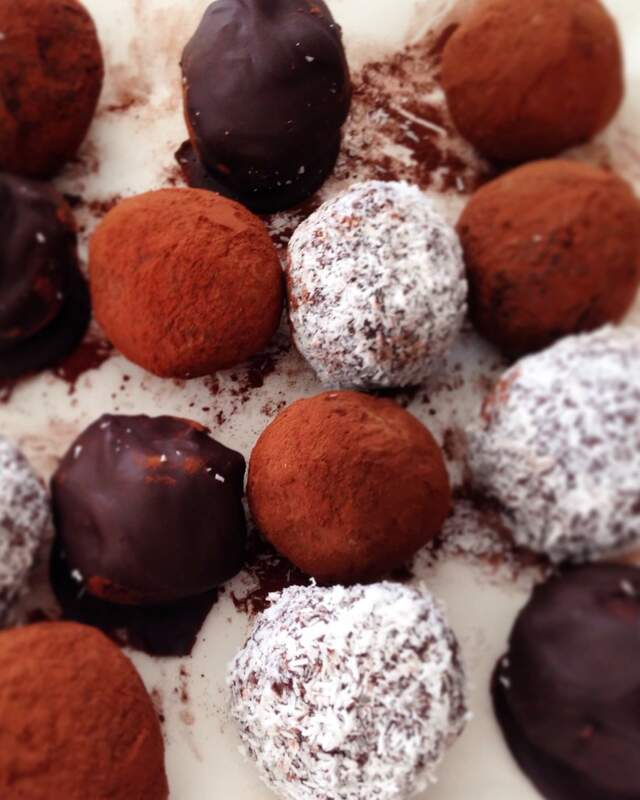 I think giving a home made gift like these truffles makes the recipient feel special too. 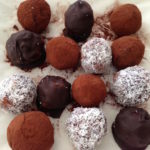 This chocolate truffles recipe is a bit different from my usual “healthier versions” type of recipe. But you know I believe in moderation and that food shouldn’t be labelled as “good” or “bad.” There are some foods you should eat more of, and some that you should eat less often. I believe that when you do indulge, you should enjoy it without any feelings of guilt or remorse. Incorporating treats into your meal planning is a good strategy for staying in control. If you feel like you go overboard too often, then read this article for my best tips on DEALING WITH TEMPTATION. It’s also important to use really good quality ingredients, especially when it comes to chocolate. Cheap chocolate usually contains less cacao powder, more sugar and more artificial additives. So when you make these truffles, please us really good quality dark chocolate, that is at least 70% cocoa. Read more about why that’s important in my MAKE YOUR OWN HEALTHY CHOCOLATE post. 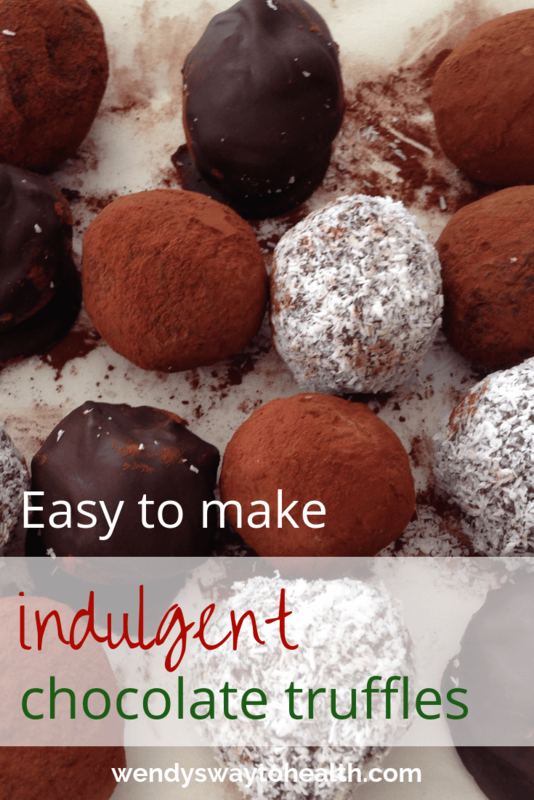 Make these chocolate truffles as an indulgent treat for your loved ones at Christmas or spoil that special someone on Valentine's Day. Break the chocolate into small pieces and combine with the cream in a medium sized bowl. Heat over a saucepan of simmering water. Keep the heat low and stir until the chocolate is completely melted and you have a smooth mixture. Remove from the heat, stir in your desired filling such as chopped nuts, or orange rind and Cointreau. Cover the bowl with cling film and place in the fridge for 30-60 minutes, until the mixture is firm, but not completely set. Remove from the fridge and roll into balls. Place on a tray lined with baking paper and put the truffles back into the fridge for another hour. Coat the truffles by rolling in dessicated coconut, cocoa powder or melted chocolate and put back in the fridge for 2-3 hours to set. 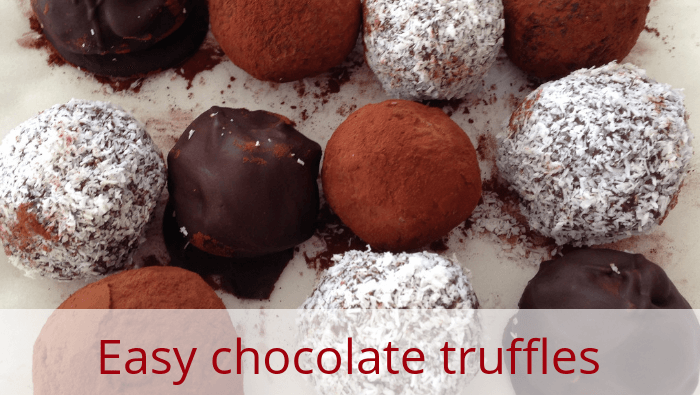 This recipe will make 10-12 truffles, depending on size. I don’t think it matters if they're not all exactly the same size or perfectly round – that’s the beauty of them being truly hand made.